Use Love to Enable Productivity – Love. Life. Practice. Like most to-dos: not really ugly, but you wouldn’t want to wake up with it on your pillow. If you’ve not been acquainted with Havi’s idea of the “idowanna iguana”, it’s pretty charming. 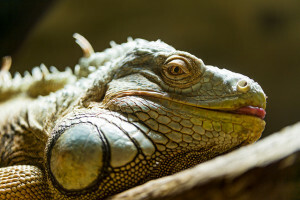 Illustrated, even, and the post recently about how iguanas really just want to be unicorns (making their way through the transition of being the rather mixed-message iguanacorn, of course) made me chuckle and think a lot about my own “iguana” collection. Today my big iguana was cleaning my desk. My partner Natasha’s big iguana was getting a flu shot. My iguana-desk made me dread the commute to work (all ten feet from the bedroom) because of the chaos that would be waiting for me, not to mention the bills, the potential for missed correspondence, or even (eep!) things I’d forgotten to send out over the holidays. Natasha, on the other hand, just really doesn’t like needles. That dislike had grown into a mutant iguana that was quite in favor of medical advances like vaccines, antibiotics, painkillers, but refused to believe that these “flu shots” were anything more than a hoax. Today I did, in fact conquer my desk. In case you’re wondering, listening to the Tim Ferriss podcast while cleaning off a desk can make you feel like every put-away file, every discarded paper, every shelved book is part of you turning into a PRODUCTIVITY ROCK STAR. Even if you don’t actually produce anything. Doesn’t matter. ROCK STAR. And when Natasha got home, she exclaimed “You found your desk!” (yes, it was that bad), and I got a little happy glow of Yes, yes I did. Did I mention that I listened to Tim Ferriss and I am now a Productivity ROCK STAR! Then she got a pouty face on, because it was time for her to go get her shot. And I cheerfully bid her farewell, and smiled and told her it was nowhere near as bad as a tetanus shot, and hey, they might just let her inhale it instead of sticking her (the VA just stuck a needle in me, but that’s typical treatment for a jarhead). Her boss also encouraged her to get the shot, since they’ve lost some people to flu already this season. That’s when I realized that one of the keys to dealing with your own iguana is much like dealing with kids: the ones that belong to other people are much easier to deal with than your own. You can make this into a strength, and let your loved ones know what kind of things you are dreading, that you really don’t want to do – and love those tasks for them. It’s so great to see you taking care of yourself and keeping healthy for me! Wow, that desk looks like it’s ready for you to write GREAT stuff! It’s important you don’t belittle the iguanas (or kids, for that matter, but let’s not digress). Telling people to “get over it” or trying to pretend it’s no big deal does not help. Of course it’s not a big deal to you – it’s not your task, it’s not your dread, it’s not your resistance keeping you from it. Rather, acknowledge that this is a big deal, and then work on giving your loved one the strength and encouragement they need to overcome it. In other words: tackle those iguanas together, and they won’t be nearly as scary. and put me over the $75/month goal! 3 posts a week, guaranteed!